MAB-CHMINACA (CAS № 1863065-92-2 ,Purity ≥98%) is a methylated form of the synthetic cannabinoid AB-CHMINACA. MAB-CHMINACA metabolite M1 is an expected metabolite of MAB-CHMINACA that is monohydroxylated on the cyclohexyl ring. The physiological and toxicological properties of this compound are not known. This product is intended for forensic and research applications.There have been a number of reported cases of deaths and hospitalizations in relation to this synthetic cannabinoid. 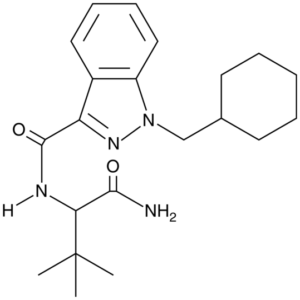 ADB-CHMINACA (also known as MAB-CHMINACA) is an indazole-based synthetic cannabinoid. 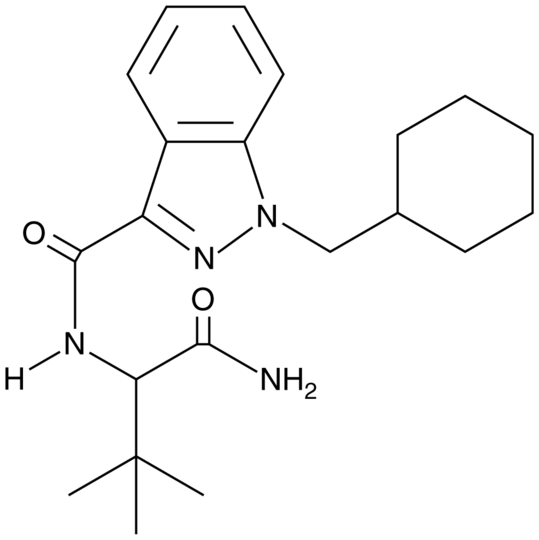 It is a potent agonist of the CB1 receptor with a binding affinity of Ki = 0.289 nM and was originally developed by Pfizer in 2009 as an analgesic medication.It was identified in cannabinoid blends in Japan in early 2015. As of October 29, 2014 Louisiana placed ADB-CHMINACA into Schedule I by emergency scheduling. Sweden’s public health agency suggested to classify ADB-CHMINACA as hazardous substance on November 10, 2014. ADB-CHMINACA is listed in the Fifth Schedule of the Misuse of Drugs Act (MDA) and therefore illegal in Singapore as of May 2015.The DEA announced its intent to place ADB-CHMINACA into Schedule I of the USA Controlled Substances Act on September 16, 2015. ADB-CHMINACA is illegal in Switzerland as of December 2015.